Tired of having your previously unopened ice cream polished off by your turd roommate? My nearest and dearest friends Ben & Jerry got your back. 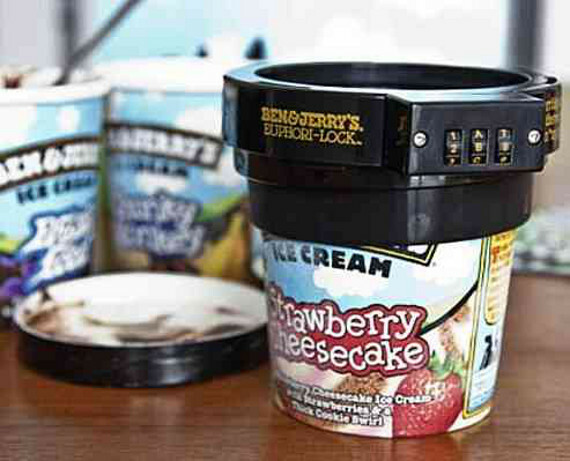 The Euphori-Lock is a combination lock that fits around your pint, preventing the lid from being removed. It’s not particularly new, but the internet is a cyclical place, people — I didn’t make the rules! Personally, I’m on the cutting edge of all things ice cream. Not to brag or anything, it’s just that I like to keep up with the most current ice cream technologies. So not only have I totally seen the pint lock, BUT I also have one. My only advice to potential buyers is this: don’t forget the combination. That’s how you end up spending your evening frantically trying to crack the code before your pint of Chunky Monkey melts.